When I left you last, I was telling you about the crazy idea I had on Friday night: to start a whole new scarf to solve the problem of two gifts that had to be ready by Saturday around 5pm, so that I could do a third while I was out at a concert that night. Okay, maybe I didn't mention that last part. It was looking pretty grim on that first evening let me tell you. That's a whole lot of pretty scarf, isn't it. 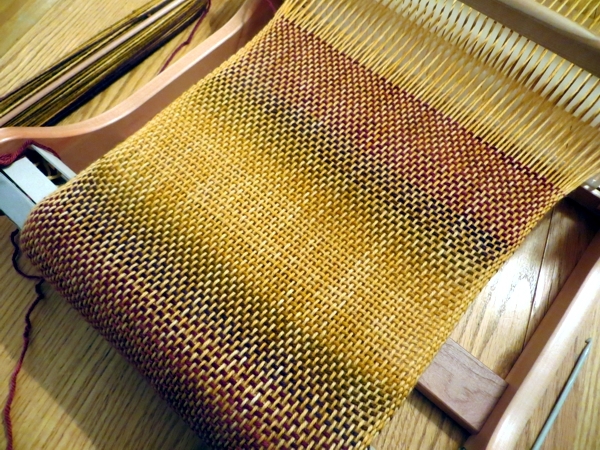 This time I set the loom up with DK weight Duchess, from Twisted Fiber Art, left over from my UpCountry Hat and Cowl. I'd been saving it for socks, but it was something of an emergency. 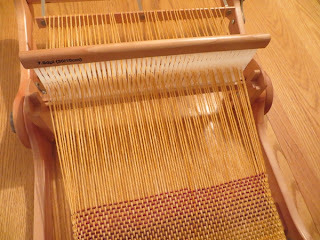 So: by about 7pm I was sitting down and weaving, and hoping for the best. 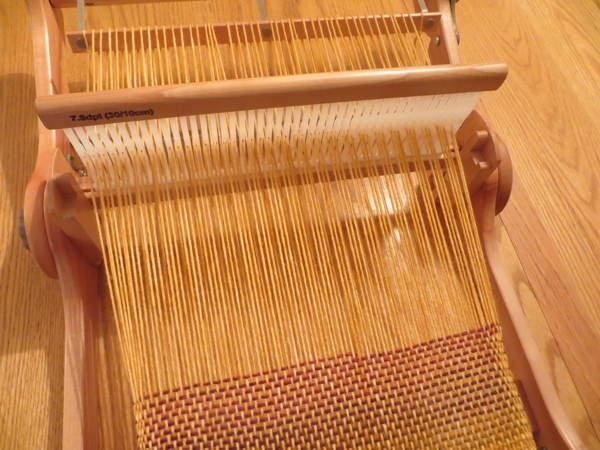 After a while at the loom I started to think about what was going to happen when I had to change yarn. I mean, I managed to get the loom set up with just short of all the semisolid yarn I had, but the striped yarn was in two cakes left over from the two previous projects and I was going to have to match up the stripes if the continuity of the middle of the scarf was going to compensate for the lack of it at the edges. In the event, matching the stripes wasn't hard at all - I just made sure I stopped at an obvious colour shift so I could overlap with the same one shift on the next cake. Hiding the overlap? that was more interesting. Eventually I remembered reading somewhere that you can snip off some of both strands to make the join less obvious. Duchess is a 3 ply yarn, so I snipped 2 strands away from one piece, and 1 from the other, and let them lie as flat as they could. You can see that, right? It's still pretty obvious to me, but much better than it was, so - Yay! And did I mention what time it was when I was doing this? Well, it was about 8:30. And there I was, halfway through my yarn supply. After another while I noticed I was at the end of the roller and had to look at my watch again. Some disturbance to the space/time continuum maybe? It wasn't even 10 pm! and I'd taken a lot of breaks. Somehow, after taking 2 months over a much more interesting scarf, I managed to pull off this one in under three hours. And the quality hadn't suffered either, since both are rather lacking in expertise. 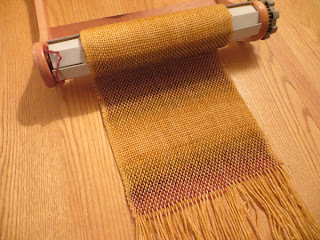 La la la, off the loom, and suddenly I am thinking that weaving is the best thing in the whole world. 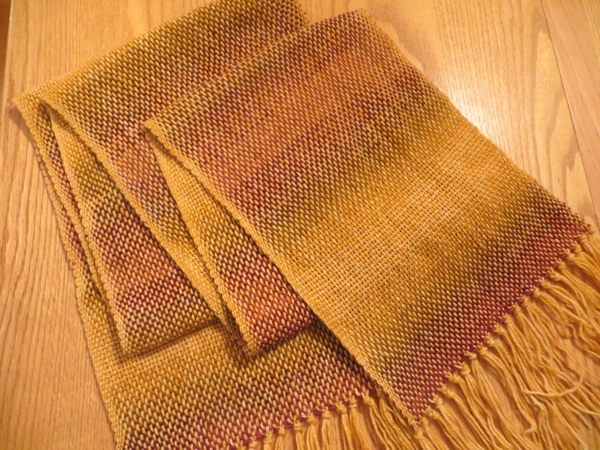 I could not have finished a cowl in less time than I finished this scarf, and the scarf is a little more versatile. So impressed with this thing, truly. And I will admit, I am looking at the tons of other yarn I would normally never consider weaving with, and considering this very speedy route to stash reduction/present readiness. But I put the loom away anyway as soon as I had the two scarves into their blocking baths because Omigosh, two more presents to make the next day! Plus a few other distractions the day after, some of which I'll show you tomorrow if you have a chance to drop by. Till then, have a great day, and good luck with any gift-making you're getting up to. Very pretty and wonderfully done! 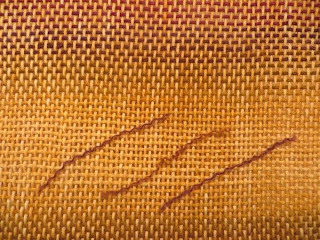 And as for changing yarns...just overlap and let the "wabisabi" of the join be the hand-made part of the project. 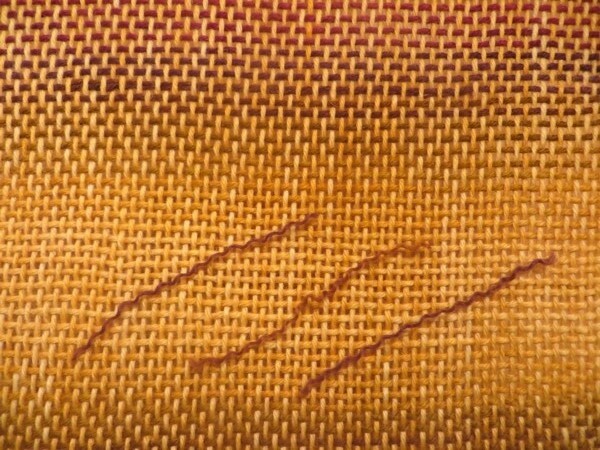 I've never ever had a woven join come undone--even with slippery yarn or the hard-wearing towels. I consider it some form of magic that is physics. It looks lovely! And nice selvedges! What a lucky recipient.